Big blocks, bling and babes. 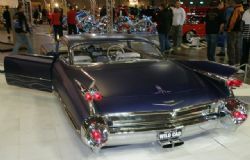 The Sydney Custom Auto Expo held in conjunction with Meguiars MotorEx at Sydney Olympic Park, Homebush had all three in abundance. The show ran over the second weekend in July and this year I was back to check out what classics, customs, rods and car club displays were on show as well as the various vendors who attend this event. 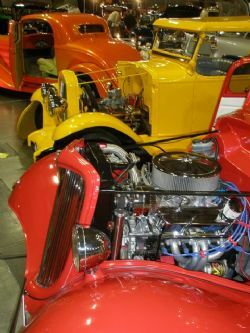 It is billed by the AHRC as the largest and most prestigious Hot Rod, Custom and Street Machine show in Australia and has various prestigious awards up grabs. The quality and calibre of the cars on show mirrors the billing and under the main dome was an attention grabbing selection of pristinely built and presented rods and custom cars. I always like to get there as they open the doors and the grey dismal skies accompanied by eleven degree temperatures aided me in being able to walk straight up to the ticket counter, lay down the hard earned and get straight inside. First impressions were the quality of the cars on show was higher than previous years and to become a finalist in this event requires years of work in your shed or if you are paying someone to do it for you, very deep pockets. Then again, it’s probably both. There was more space to check out the cars and I couldn’t really tell if this reflected fewer on the floor than previous years but there was certainly enough to whet all appetites. In the back hall a number of the car clubs were well represented with quality classics from Valiant, Camaro, Chevrolet Tri Fives, Thunderbirds, Panel vans, Mustangs and Holden all receiving good attention from the punters. The club members were only too willing to engage those that had questions and up the back of the hall was an array of classics that were to be auctioned off by Shannons later in the afternoon. After buzzing around and taking some photos before it got too busy I went back and had a closer look at a number of the show cars on display. The level of customisation, workmanship and detail was outstanding. It is not enough to have a slick paint job and a set of wheels to walk away with any prizes here. Polished and chromed drive lines, customised bodywork and stunning interiors will get you to the starting blocks but to get into the trophies you need all that plus an overall package that reflects a vision that will make your ride stand out in the crowd. No easy task. If someone said to me you can have your pick of any car here to take home I would probably still be trying to make up my mind. So many gorgeous rods, clean customs and cool classics. A judge’s job would have a difficulty rating of 10. With my 57 Chev Nomad project coming along I had an opportunity to check out a red 57 two door on display in the main dome and see what the owner of this magnificent car had done. The detail was mind boggling. Custom built bits everywhere. Hood bullets, grille bar, hood bar, hinge covers and dash were only some of the one off fabrication work on this car. 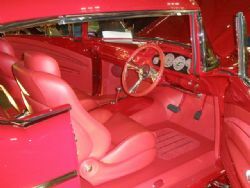 The photo of the interior shows the flat leather covered floor, custom console, dash and gauges. The exhaust was an exquisite piece of art yet you wouldn’t see it without the mirrors on the floor. I heard the owner has over seven hundred thousand invested - do you think the owner drives it? This year there appeared to be a few ring ins and there were a number of rice cookers and vans with big stereos with the mandatory doof doof that would make your ears bleed if your stood around them for too long. An impressive array of tricked out choppers were in various sections around the halls and a number of vendors were on hand to promote their products or sell you everything from tees and badges to wheels and tyres. As I was leaving the place was getting very busy and it was a good mixed crowd. Lots of families, kids and women all admiring the visual delights. Some of the women appeared more enthusiastic than the blokes they were with which can only be good for the hobby. If you’re at a loose end for something to do in early July it is well worth your time to check out the Sydney Custom Auto Expo.